Spoke is excited to offer visibility filters for Spoke Knowledge base resources! 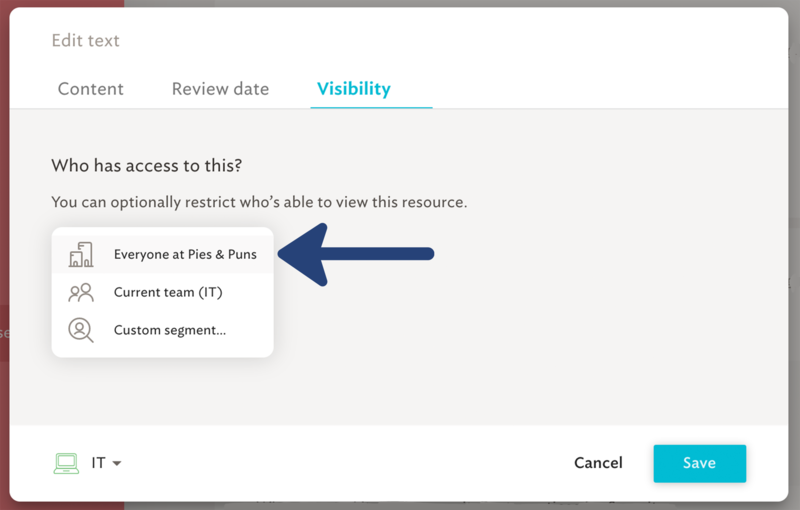 Customers on Spoke Plus plan can choose to create filters to restrict or allow access to knowledge base articles, based on User Profiles. Authors will always be able to view and edit any resource they've created. This is the case no matter what filters are set up. 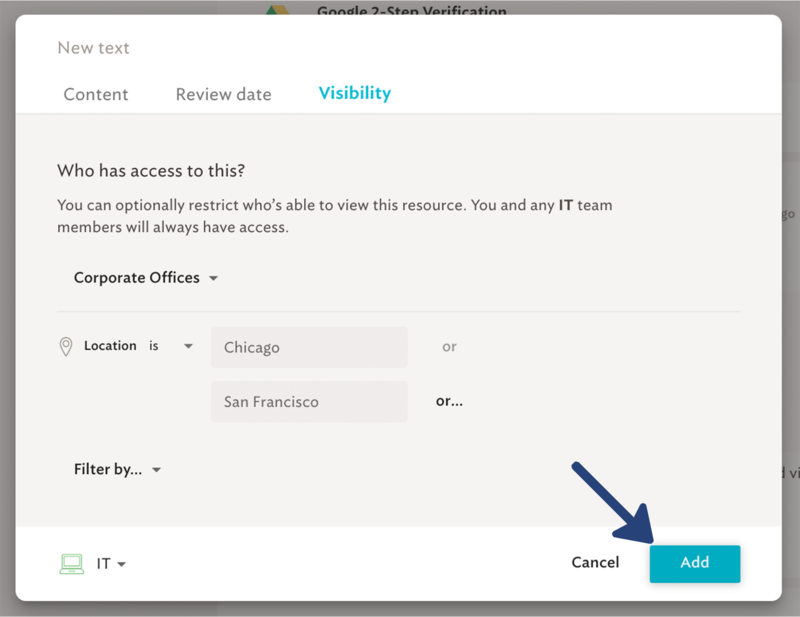 Anyone with the ability to edit a KB resource can set or change visibility filters. 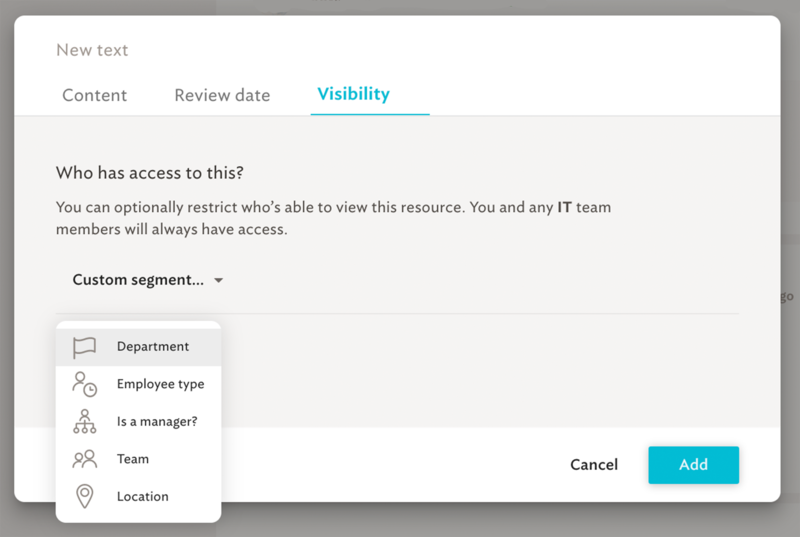 Any resource not given a filter is viewable by the entire organization. Begin by selecting the "+" then choose which type of knowledge base resource you'd like to create. 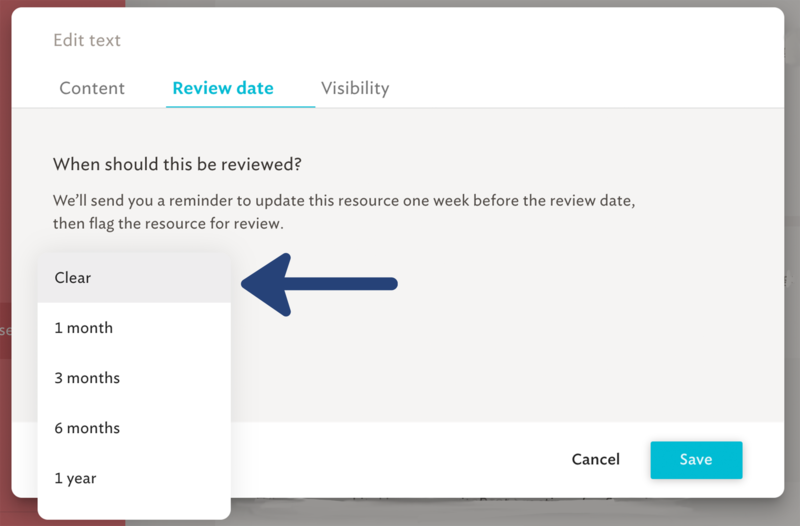 Navigate to the "Review date" menu to select a date to review the content for accuracy. 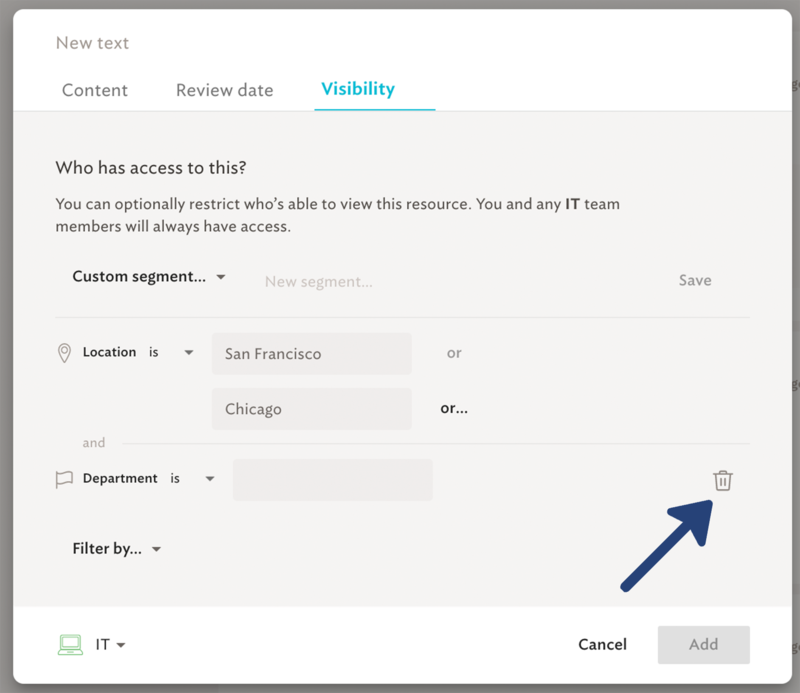 To create filters which limit who can view the resource, select the "Visibility" tab. Here, you can build a filter based on user profile attributes. Click "Everyone at Company" to reveal a dropdown of options. 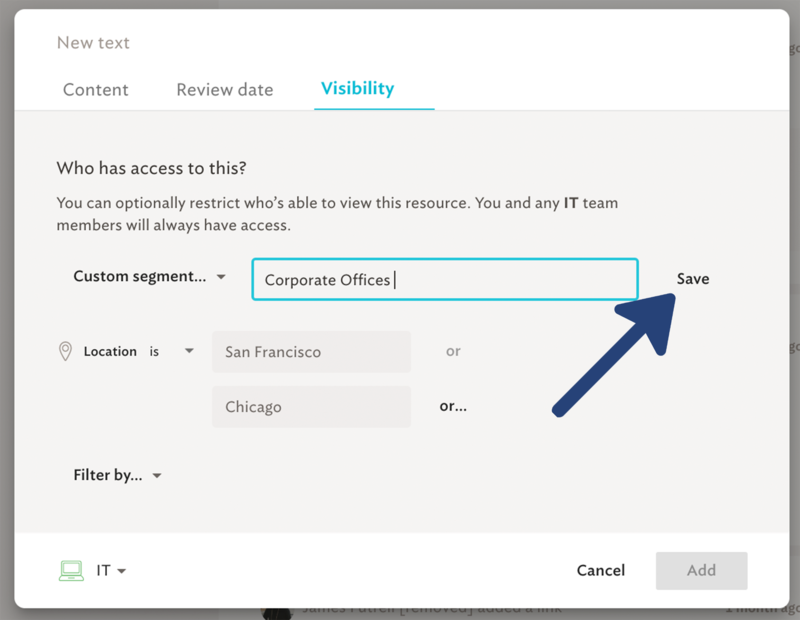 Everyone at Company - This setting allows any Spoke user in your company to view this article. Choosing this does not restrict view. Current Team (Team the resource is filed under) - Choosing this filter only allows members of the current team to view the resources. This is useful if teams have internal documentation or training materials that shouldn't be visible to the whole company. 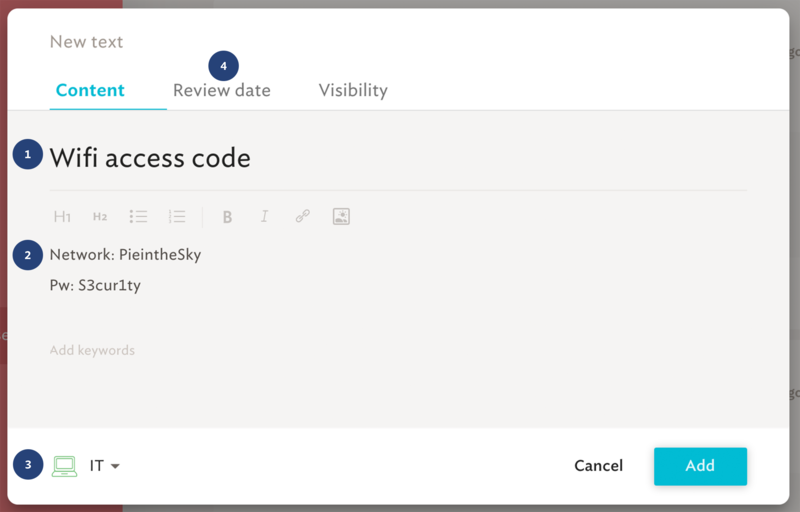 Spoke's resource visibility also allows you to create custom segments. 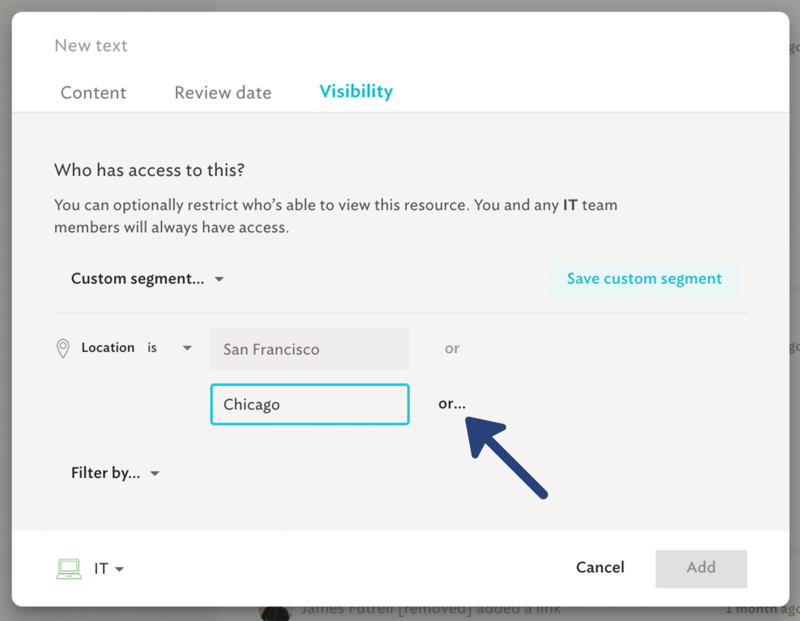 These segments create custom filters that take multiple user attributes into account. When building a custom segment, filters can be used individually or combined with others, to target specific groups with a knowledge base resource. Select from the drop down to build a custom segment. To add multiple attributes to a filter, such as multiple locations which should view the resource, click "Or" and enter the next attribute. To remove a filter from a custom segment, hover your mouse over the right side of the filter and select the garbage icon. Once a segment is created, it can be saved for later use. To save a custom segment, click "Save Custom Segment" then enter a name for the segment and click "Save"
Finally, make sure to select "Add" to add the resource to the Knowledge Base.